Better lesson organization is one of my main goals for the upcoming school year. Having a high school student, middle school student and a kindergartener, I have no choice but to be more organized – or feel flustered and fall behind too often like I did last year when I was less prepared. 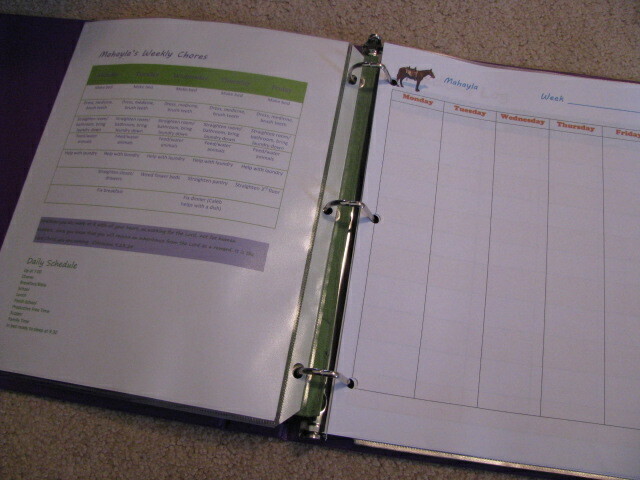 I have a newly organized planning notebook for myself and both of the big kids have their own weekly binder. 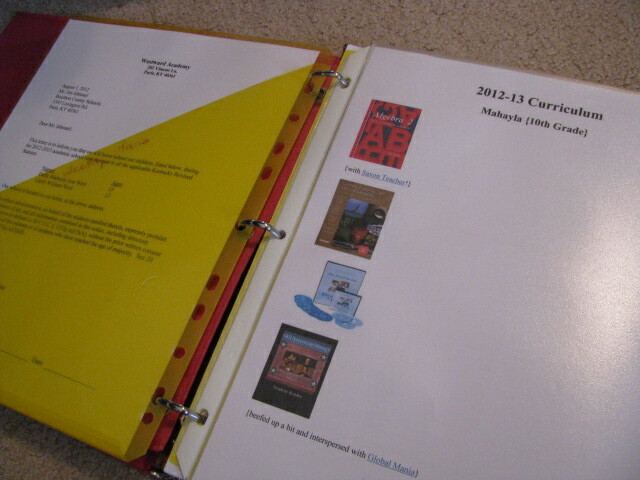 Besides organization, the binders are going to help the kiddos work towards more work independence and responsibility. 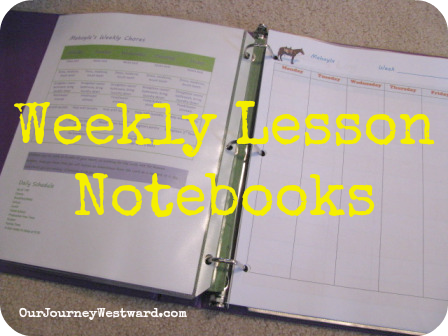 I’m so excited about these weekly lesson notebooks! 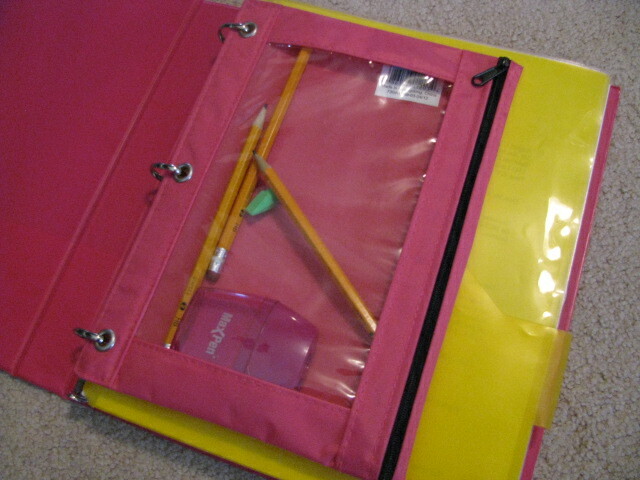 The pocket pouch holds a highlighter, pencils, erasers and a pencil sharpener. Only the necessities for those times when they take school somewhere other than the school room. These pages will be the main stop daily. 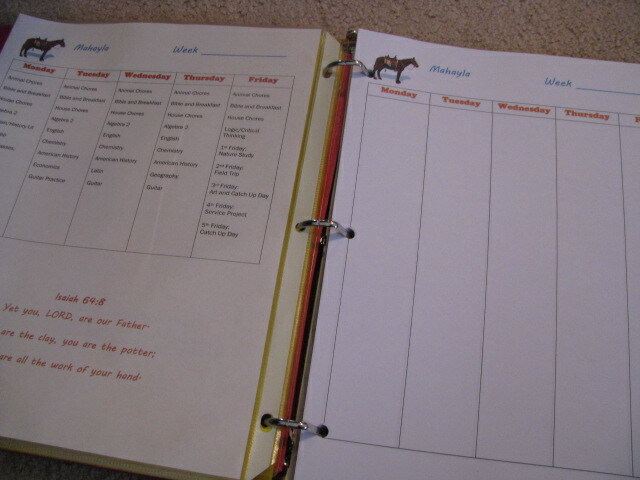 The kids will make sure their daily chores have been completed and then move on to the lessons assigned. 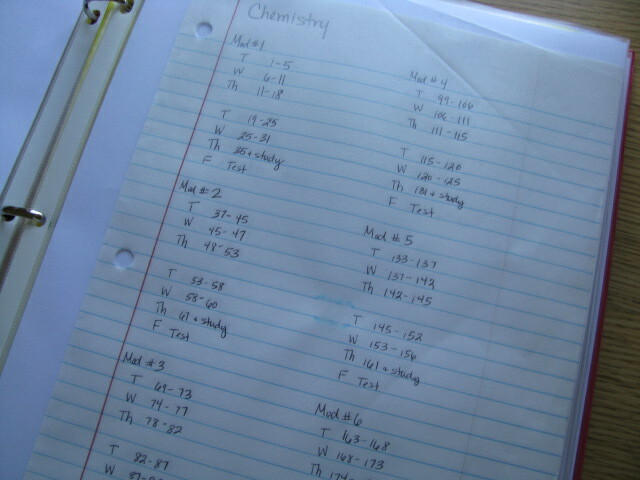 Using the typical weekly schedule in my notebook (below), I will jot down daily assignments a week at a time. Any reproducibles or worksheets that apply to particular lessons will be placed in the appropriate day’s pocket (again, below.) 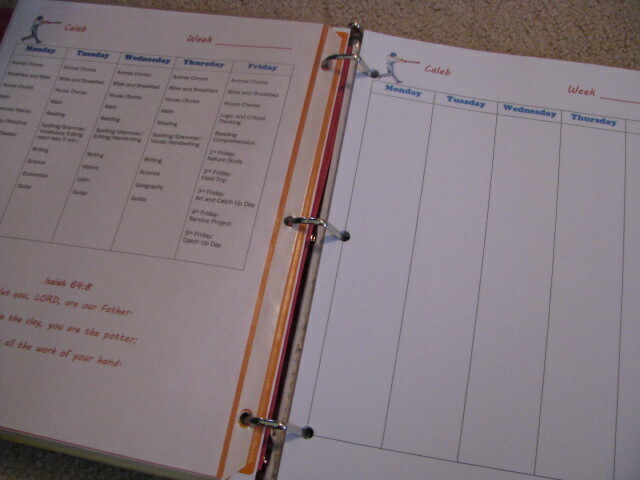 As an assignment is completed, the kids will highlight it on the lesson plan sheet and place completed work in a pocket at the back of the binder. At the end of the day (or week), I will grade what needs to be graded and file away the completed work. We read a lot around here, but the necessary, assigned books don’t always get the attention they deserve. The kids either lose interest and don’t finish the books, or they drag on way too long. 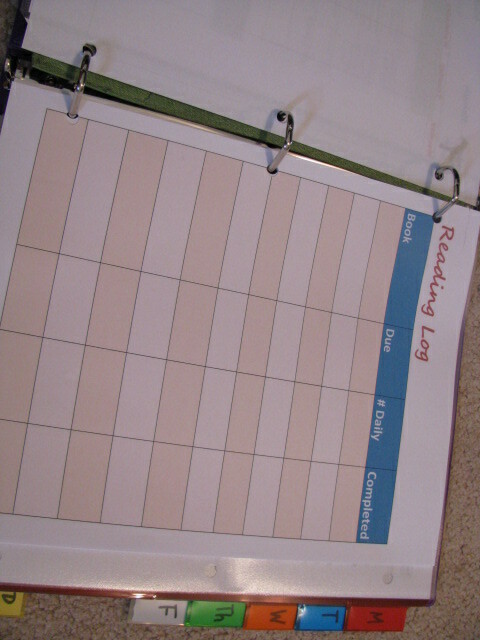 The reading log will help solve that problem. 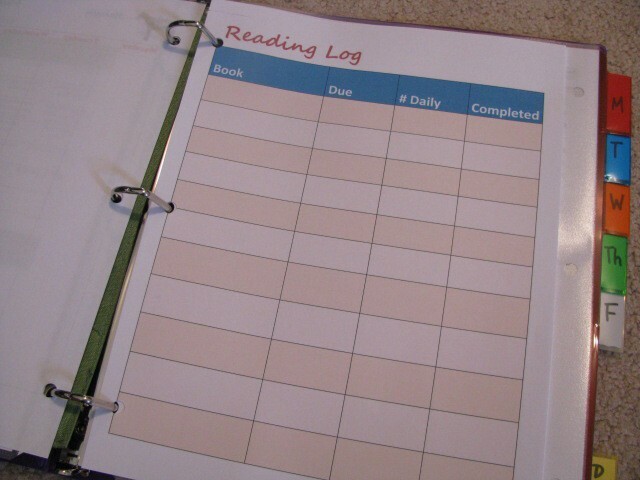 Not only will the kids jot down books they read for fun, but this chart allows us to set a due date and plan out how many pages or chapters will need to be read daily to meet the due date. 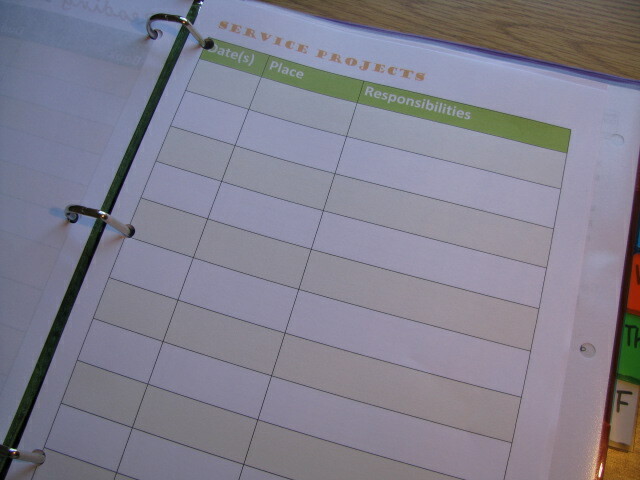 The service project log won’t be in the middle school binder. I wanted Mahayla, the high schooler, to have a place to keep records of all the community service she does for the purpose of completing a transcript or portfolio as she plans for college in the next couple of years. I haven’t always kept grades, and I’m not promising I’ll go overboard this year. However, for better accountability, I’m planning to be better about keeping a grade book. 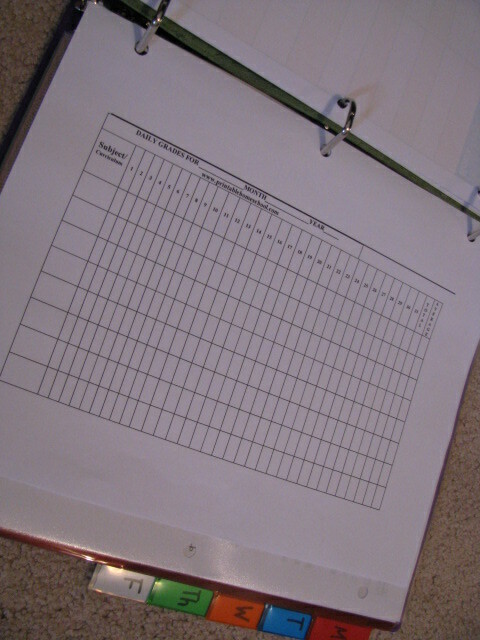 I found this grade sheet from PrintableHomeschool.com. The high school transcript and requirements sheets are simply there to keep Mahayla completely “in the know” about what she needs to accomplish and what she has already accomplished for a college-bound education. I use Homeschool Transcript, an online transcript generator that automatically calculates GPA credits, GPA points and cumulative GPA – including weighted averages for honors or AP courses. You can get a 30-day free trial, but at only $16.00 – $12 for HSLDA members – it’s worth purchasing! 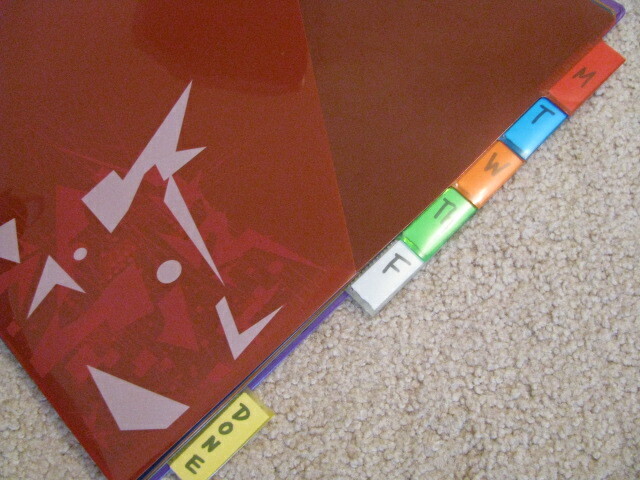 There are six pocket dividers in the back of the book. One for each day of the week, and one for completed work. 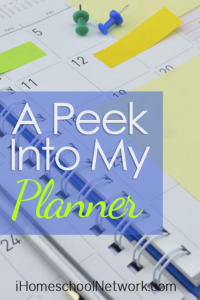 As I make lessons plans for the week ahead, I’ll put in any pull-out worksheets or reproducibles that I’m able and place them in the appropriate day’s pocket. For lessons that can’t be placed in the pockets, I’ll jot down page numbers for the kids so everyone knows exactly what work to do. Beside their desks, each of them have a crate that houses all their textbooks and workbooks, so they will always know where to find their work. Eli won’t have a binder, but we will implement a chore board and workbox for him to begin teaching him some independence and responsibility. 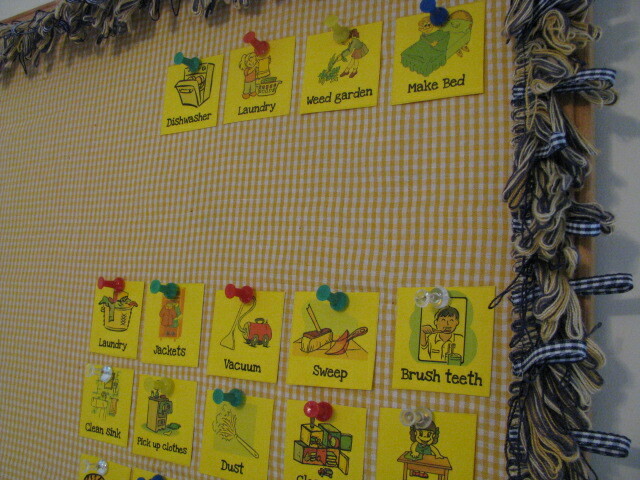 His chore board is simply a set of preschool chore cards (from Jolanthe at Homeschool Creations) pinned to a small cork board. I will move the day’s particular chores to the top of the board and he will move them to the bottom once completed. 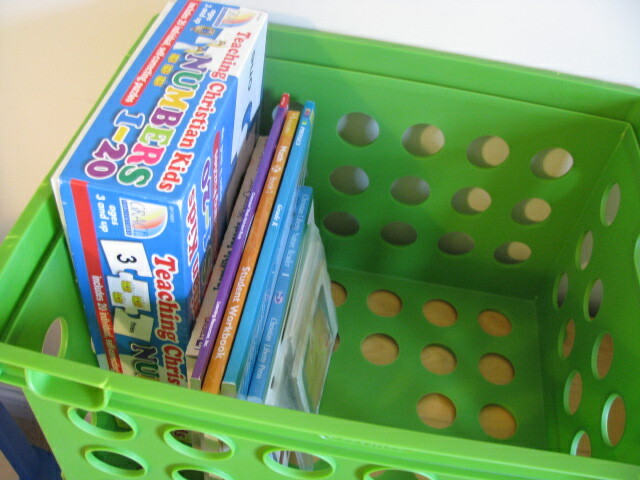 His workbox is just a big ol’ crate where I will place the supplies for his school day. We’ll explore the crate together to decide what he can do by himself and what we will work on together. As activities are completed, papers will be put in a special Eli spot and other supplies will be put away. My pocket pouch holds a few pencils and a pencil sharpener so I don’t have to search the house for supplies when it’s time to plan. Having an up-to-date calendar in my planning binder is of utmost importance! 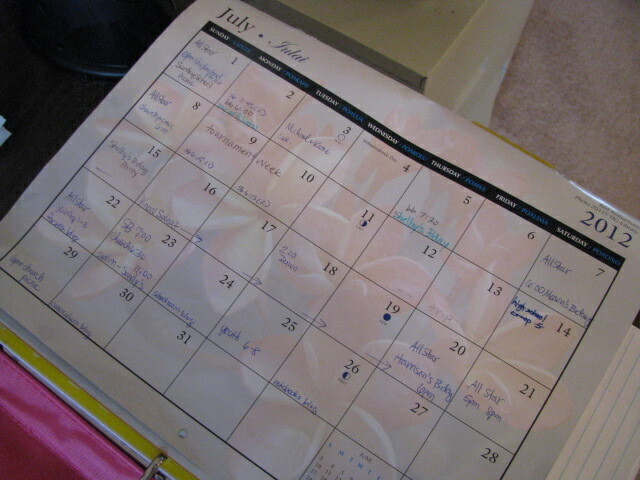 It helps me know how to schedule the coming days as I take into consideration things like appointments and field trips. The pocket divider on the left holds official documents – a copy of my letter to the board of education and anything else I deem important. 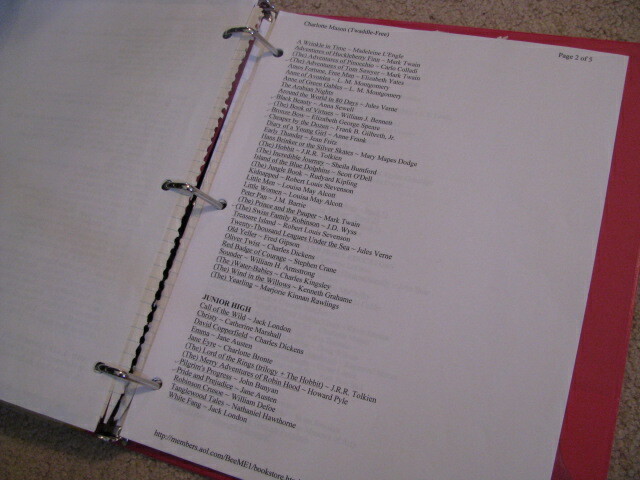 Page protectors hold lists of each child’s curriculum (copied from my blog post.) 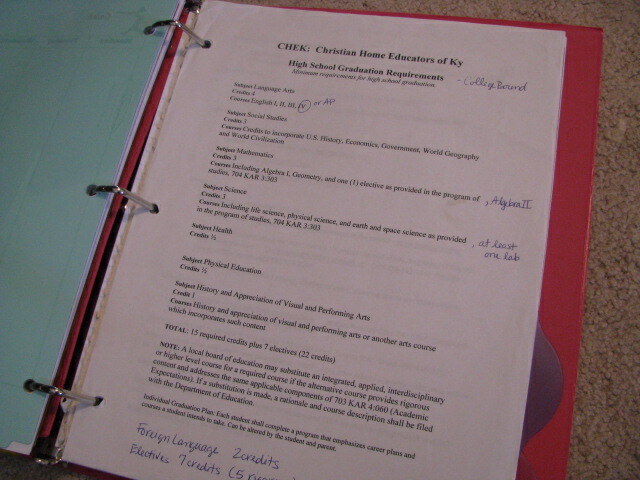 I use the curriculum lists as reference for myself when planning and then file them away in end-of-the-year portfolios as a record of what curriculum was used. Mahayla will be taking a chemistry lab on Mondays at co-op and trying to fit bookwork into T-W-Th. 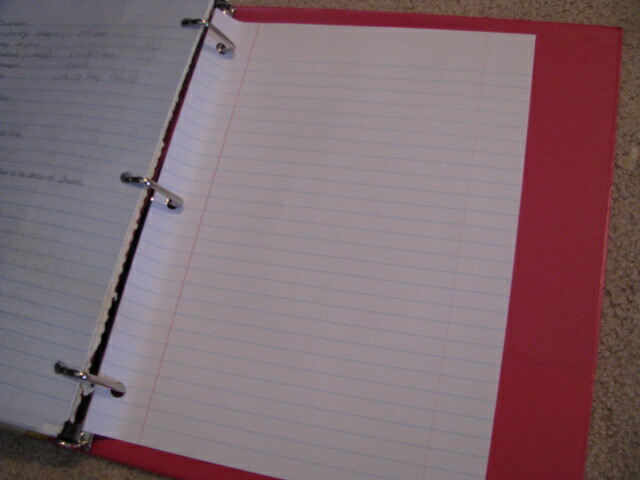 To make sure we cover everything, I jotted down pages that needed to be covered daily. We likely won’t stick to this year-at-a-glance plan perfectly, but having the lessons broken down into manageable bites will keep us on track to completion by the end of the year. Fridays will be a little different than the rest of the week. On the first Friday of the month, we’ll go somewhere for a nature walk. The second Friday we’ll go on a field trip. The third Friday we’ll dedicate the day to art and artist study. And the fourth Friday we’ll head out for service projects. 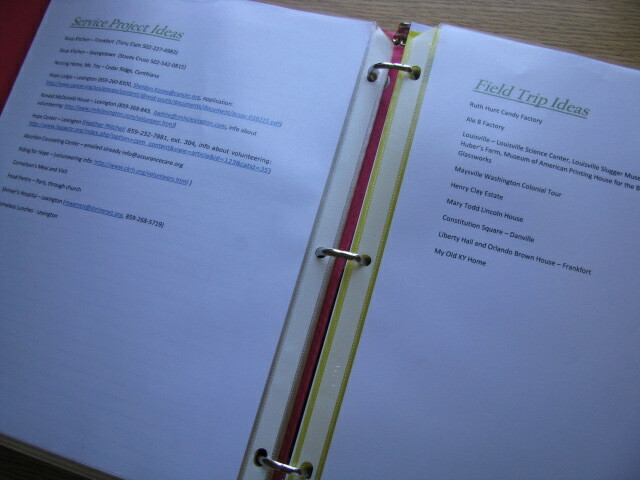 So that I’m not scrambling each Friday to figure out where we’re going or what we’re doing, I’ve created some idea lists for service projects (with contact numbers/emails), field trips and nature walks. Some of you have asked for a copy of my weekly lesson forms. I have included one of them as a Word doc that you can edit. It’s really nothing more than creating a table in Word and changing fonts and colors to make it pretty. It feels SO good to be organized!! Wow. You are so organized. You did a great job and the pictures and descriptions are great! Oh… also, will YOU be the one filling in the kiddos weekly lesson forms, or will you write them on the board and allow them to copy them… or, maybe dictate to them their assignments for the week? Gotcha. That’s what I thought:) And… next time I’m in KY, I’m lookin’ you up. Maybe a cup o joe? o, and one last thing… Can I get a closer look at Caleb’s weelky assignment plan, and possibly the one with the chores (only Caleb’s)? He is close in age with my kiddo. Hope I’m not creepin’ too much! This is the kind of organized I would like to be! Last year, I made a gorgeous planner along these same lines…and then I accepted a part-time job out of the house….and we misplaced the gorgeous planner the second week and only found it in May. Sigh. Candice, I posted Caleb’s weekly school schedule at https://ourjourneywestward.com/2012/07/2012-13-curriculum-and-schedule/. I’ll send a copy of his chore schedule to your email. And, yes, please look me up next time you’re in KY!! visiting from “print-a-palooza”. great organizing!! By the way, I have a Caleb, an Eli, and a Michaela! lol! Cindy, You Rock! Thanks so much for sharing so much stuff on your website! This will be my 2nd year homeschooling. Last year (my first year hs) was pretty easy because we were traveling the US for a year. We did a lot of field trips and history! 🙂 I have 5 girls and organization will be key to keeping us all on track and happy. Thanks again! Aw, you are VERY welcome! 😮 What a fun year last year must have been!! Oh my gosh this looks awesome. It appears to be a lot of work to set up initially. However, it seems very specific to each child. 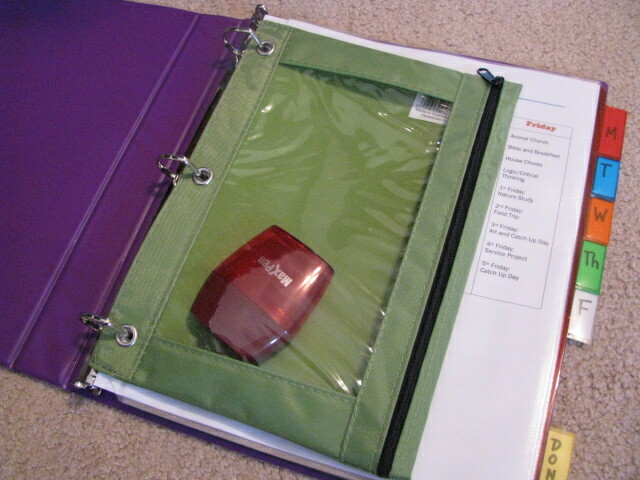 The learning pockets are also a great space saver. 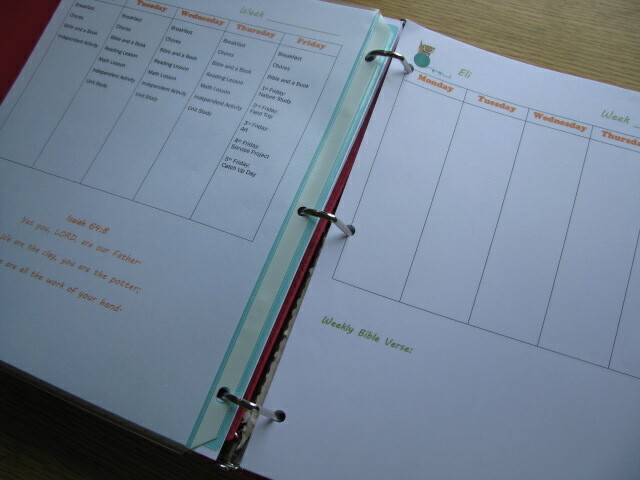 I use workboxes but also have a weekly planner for each kid that they use to guide their day. Cindy, you are my new best friend! I just finished reading your book “Homeschooling Gifted and Advanced Learners”. Now, I feel like a stalker because I want to know all about how you homeschool! (I promise I’m harmless.) I am preparing to teach my gifted 6th-grader at home this next year, and this is my first time to homeschool. While searching online for helpful info, I somehow came across your book. I downloaded the sample exerpt on my nook, read it, and immediately bought the book. I had no intention of reading a whole book right now because, let’s be honest, I have LOTS of work to do toward preparing to homeschool. But, I’m SO glad I read it! THANK YOU for leaving out all the “fluff” info, too. You got me down to basics and the nitty-gritty I need. All the references you listed are going to be total life-savers for me! 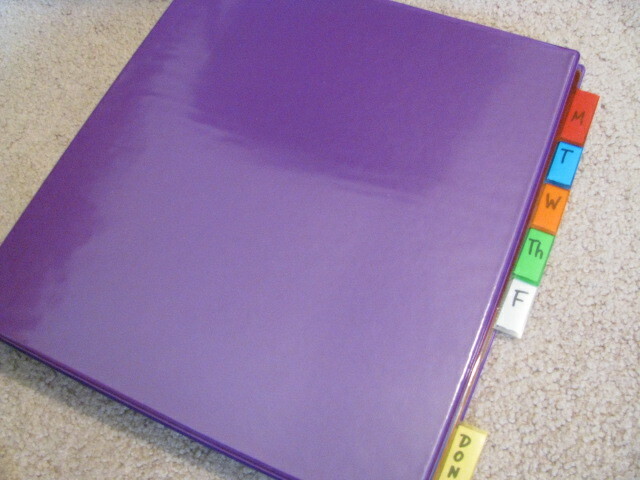 In this post, I love how you created these folders to keep things organized and on-track! I love to be organized, but most of the time….well…you know. I’m going to stalk your blog some more and find all your other great ideas. I was pretty much terrified before I found your book, but you actually have me excited about this upcoming school year! 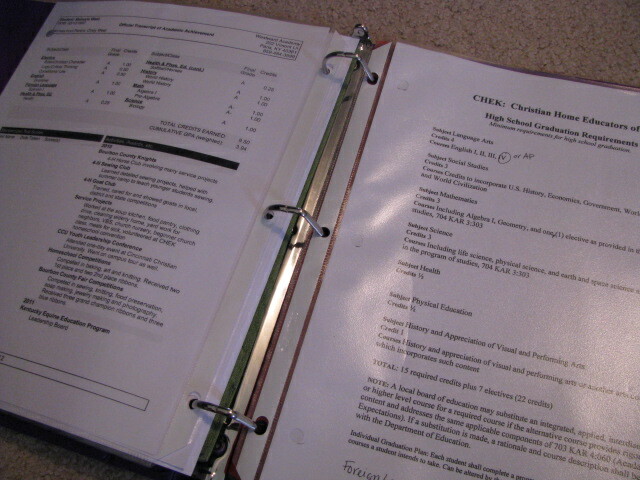 We are going to keep the clipboard to pull one day of work when it needs to travel with us for an appointment as I hope to maintain the old sheets in the book. Mary, I’m so glad you found something helpful! I find myself forever tweaking, but this system has been VERY good for us all. Have a GREAT new school year, Holli!